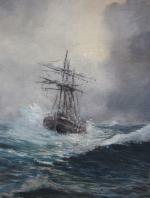 Classical marine painting with a sailing ship in the stormy sea was executed on the turn of 20th Century by an Austrian (due to the provenance) painter, it signed difficult to read: "Kirc...". Inscription: signed lower right indistinctly. Technique: oil on canvas, original gilt frame. Measurements: unframed w 35 5/8„ x h 27 1/2" (90,5 x 70 cm); framed w 43 1/4“ x h 39 1/4" (110 x 99.5 cm). Condition: in good original condition..